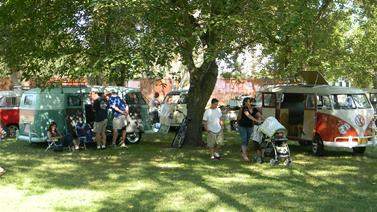 Barndoors to Eurovans and everything in between! 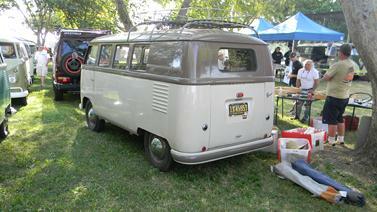 Dean's 1955 Microbus, also featured on t-shirt artwork. Buses came from as far away as Reno for Bus Fest! Where can you find Volkswagen buses ranging from a 1951 ex-Westinghouse television repair van to a four-wheel drive Vanagon with solar power and more? At Nor Cal Bus Fest of course! Bus Fest 8 was held on Sunday August 12 at its new location at the Contra Costa County Fairgrounds in Antioch, California. Worries over the unusually hot weather quickly diminished as the buses and trucks (sixty in all) rolled through the gates of the tree-shaded front park venue, which proved to be comfortable all day despite temperatures approaching the century mark. 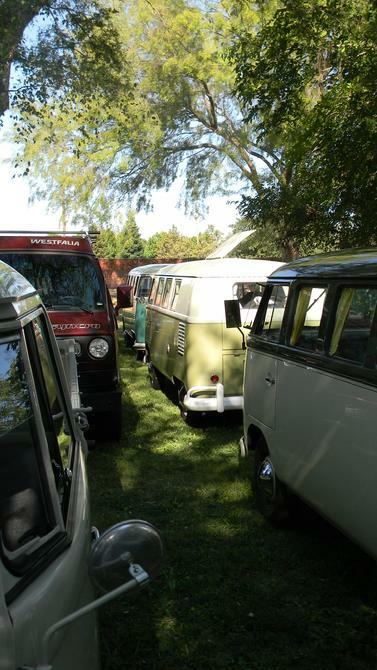 One of the highlights of the event was an impressive lineup of Westfalia campers, some original, some fully-restored and one completely tricked out. Christopher drove in all the way from Willits and Eric cruised over from Concord, both in clean, original paint Mango Green/Seagull Grey campers. Impressive restorations included Lloyd’s Palm Green/Sand Green and Anthony’s Sealing Wax Red/Beige Grey hatch top campers, which both attracted lots of attention. Eric’s Syncro Vanagon Weekender is set up to go and camp just about anywhere, complete with 1.8 turbo power, off-road suspension and solar panels on the roof. 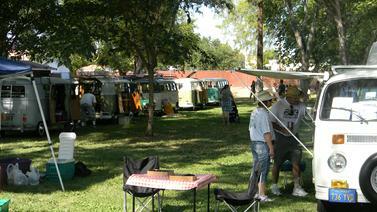 Other notable transporters on display were Larry’s immaculate 1960 Single Cab pickup, Dean’s very original 1955 Barndoor Microbus (which was also featured on the event t-shirts) and Mark’s 1951 Westinghouse logoed former television repair van, which has been off the road for several years. Several swappers were hawking their wares under the trees including Bus Farmers and Nor-Cal Relics, and I think I saw Sean and Roger with goodies by their Double Cab and Single Cab trucks. Those not driving Type II’s pressed several large picnic tables into service and appeared to be busy throughout the morning. The day ended with another amazing raffle due to the generosity of the BF8 sponsors! Longtime enthusiast and perennial supporter Al Price from Honest Engine Midtown outdid himself with a grand prize of safari windows! Other great prizes included aside step from Bus Boys, Wolfsburg West replacement rocker, windshield washer setup, seat stand mats, and WCM window and door seals, gift certificates, tune up from Gregs VW Service, shirts and hat from Vintage Warehouse and Lavere’s VW Restoration. Hats off and a huge thank you to all of our sponsors! Marilee, Ella, Tony, Scott, Ken, Gen and Tom, John and Diana all did an amazing job staffing and making the event run smoothly, thank you Bus Fest crew!